This little gyroscope really does build up your forearms, is great fun to use, and might prevent RSI from playing too many games! 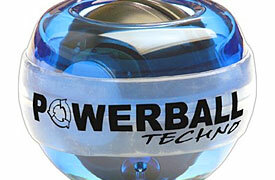 We recently received the Powerball Neon and Powerball Techno for review. I first heard of the Powerball from one of the other Writers here at Gameworld. He was telling me about a device which mostly exercises the wrist, forearm and fingers through the use of a highly precise gyroscope encased in a sphere the size of a tennis ball. I've always loved trying new gadgets, so I promptly surfed over to their web site to get some more info. Each device is packaged in an attractive box, and inside are the instructions, and two rip-cords to get your gyro spinning. The best way to describe the feeling of using a Powerball is swinging a rope with a weight attached to the end of it around in circles. I was very intrigued by the little device and it took me a few minutes to realize how it actually created such strong forces of resistance. Remember when you were a kid, and you would remove your bike tire and spin it really fast? Then you would try to turn it, but you couldn't turn it very fast because the centrifugal force created by the spinning motion of the tyre resisted your every move. The Powerball is basically like a spinning tire, which you are also turning at 90 degrees to the direction it is spinning, encased in a sphere. And the Powerball spins up to a mind-boggling 15,000 RPM! Confused? The concept is best explained through video, so I'd recommend you check out some videos of the Powerball in action at this link. I go to the gym 5 nights a week and spend a good 45 minutes doing weights. The first day I got my Powerball, I used it for around 10 minutes. The following morning my arm was so sore I could barely use it for anything! I never expected that little ball to be such an effective method of targeting the forearm muscles, but it really does work well. I'd recommend you ease into it, and try to avoid getting overly excited, as I did, on your first day of use. The Powerball seems to target muscles which aren't stressed enough simply by lifting conventional weights. This makes sense when you think about it, because the forearm muscles, wrists and fingers are some of the hardest muscle groups to target. But since the Powerball almost exclusively uses these muscles, it is ideal for this purpose. I should also point out that the Powerball also has a built-in computer that accurately measures and records your fastest spin, your strength, current speed, and total number of revolutions in any given session. Let a couple of these babies loose in the office (as we did) and a competition will undoubtedly ensue to see who can spin the Powerball the fastest! The Powerball Neon has integrated bright LED lights that really look cool in the dark! No batteries are required, as the gyroscopic forces generated by the Powerball are more than enough to light up those LEDs. 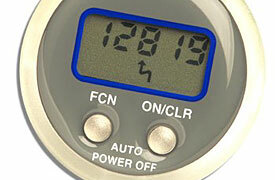 The Powerball Techno scrolls your achieved score 'magically' across the surface of the rotor (as opposed to displaying it instantly on a digital speed meter as with the other models in the range). The rotor also displays an entrancing collection of 'firelines' as it spins, ranging from red to blue in colour and giving an a truly amazing effect depending on the speed at which it is revolving. The Powerball really is a highly precise device, and when you consider the benefits they give, not only in fitness, but also in pure fun, and the fact that they come with a lifetime warranty, buying one (or three!) is a no-brainer! Health issues such as carpal tunnel syndrome and RSI are very common nowadays amongst gamers, and the Powerball should go a long way in helping prevent your body from succombing to these illnesses. I noticed there are a lot of imitation products out there, but apparently none of them spin as fast as the Powerball, and I'm inclined to believe it too. Highs: Insanely fun and addictive; World ranking tables; High quality construction; excellent customer support; affordable and practical solution to helping prevent RSI and other injuries gamers are prone to. Lows: None, except that they can be hard to find in some stores. Overall: Highly recommended to all gamers! Get one for yourself, and one for friends and family. They make great Christmas presents.